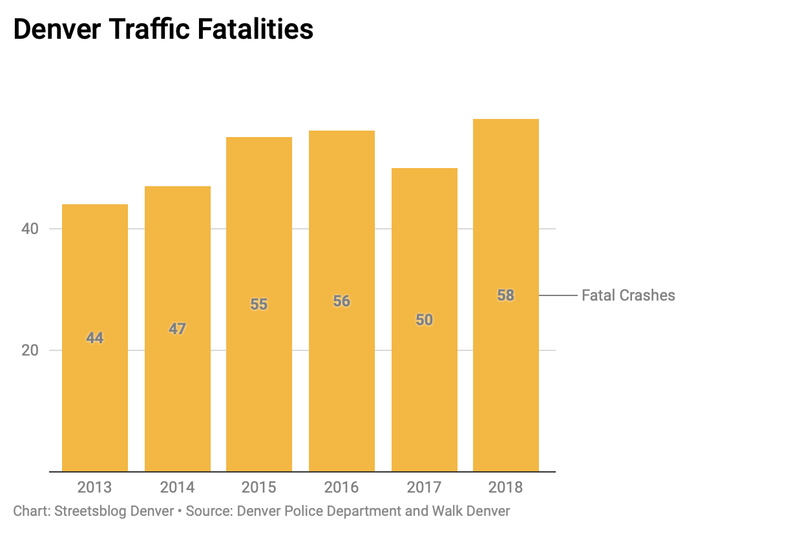 The growing number of people killed on Denver’s streets continues an upward trend over the last five years—and safety advocates are losing patience. Denver committed to end all traffic fatalities by 2030, a goal that came out of the Vision Zero movement, which originated in Sweden in the 1990s. Cities that sign onto the plan pledge to upgrade streets with measures like narrower traffic lanes, pedestrian refuges and automated traffic enforcement, which have proven effective in cities New York, where fatalities have declined since 2014. Denver says it’s making progress, but elected officials obstructed a critical component the city’s Vision Zero plan already this year. The city nearly approved a modest expansion of its red light camera program, which would have added automated enforcement on high-injury corridors. But despite rising fatalities and evidence proving that the cameras reduce deadly crashes, the Denver City Council voted unanimously earlier this month to put the program on hold—a decision they based on a dubious argument from Councilman Kevin Flynn. “Cameras are never necessary,” Flynn said in the Denver Post. He suggested that people run red lights because yellow lights switch to red too quickly, a claim that he supported by timing a handful of yellow lights with a stopwatch. This little stunt was all it took to persuade the rest of the councilmembers to halt the safety enhancement for up to nine months while other measures are studied. In addition to camera enforcement, Denver could also follow New York’s lead by increasing regular traffic enforcement and installing low-cost street design treatments like painted pedestrian refuges and plastic bollards to narrow streets and slow traffic, says Locantore. Despite the setback in the city council, the Department of Public Works will expand its street safety efforts this year. It recently ramped up the number of people working on street safety issues and it has $27 million allocated for safety and mobility improvements in the 2019 budget, says Heather Burke, a spokeswoman for the agency who listed more than a dozen improvements coming this year. 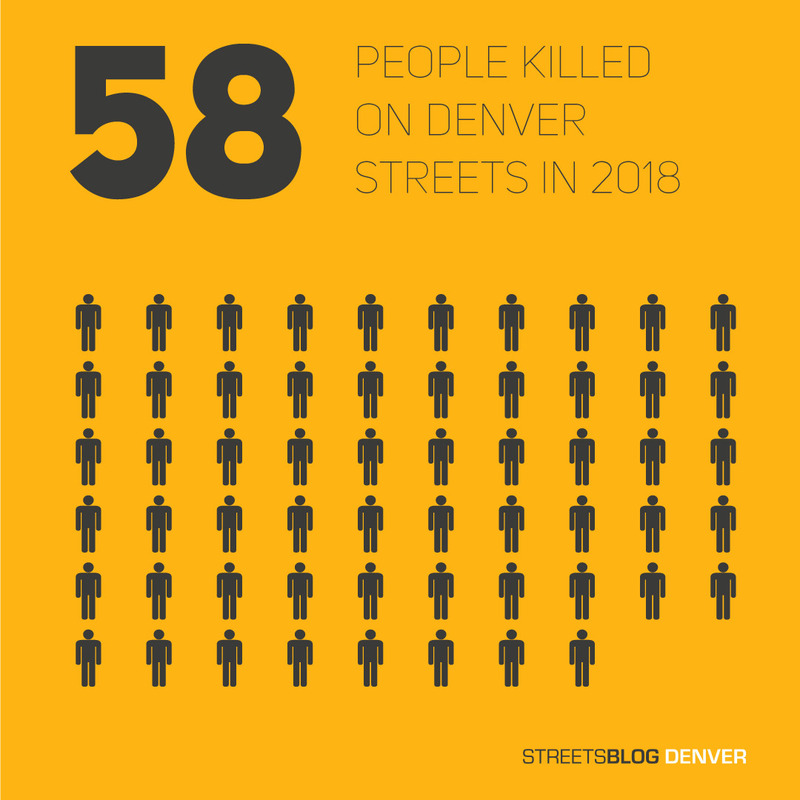 The city also will finalize its Denveright planning process this year, which will include safer street design guidelines that will be implemented over the next 20 years. Narrowing Lanes is stupid you need to make things more car friendly. Nobody’s going to ride their bike,walk, or take public transportation. It is a pipe dream get over it and start paving over everything. What? Cars are killing all of these people, not bikes. Streets can be designed for people walking, biking, or taking transit; many other cities have succesdfully done it. It’s not a pipe dream, and it’s better for the environment anyway. I think he was making a big tongue-in-cheek comment. Oh… Well, now that you mention it, yeah… Whoops. I’m happy to accommodate Councilman Kevin Flynn. If this turns out to be “dubious” then we’ll know. But if extending the yellow timing happens to have a positive result why begrudge improvement however it happens? IIRC, there was an end-of-year ‘death rush’ that bumped the number up over the four-year average of 55. On the positive side, when you consider the population increase and more importantly the the increase in vehicle registrations over the last four years that’s a solid (if sad) result. LOL. So you’re saying if not for all those people that got killed on the roads last year, there wouldn’t have been many deaths on the roads last year. Killer logic! How about our elected officials not rely on one biased person’s anecdotal evidence and instead rely on common sense and scientific studies performed by experts to make their decisions? Want to extend the timing for yellows? Fine. But how about we not let people continue dying in the meantime because Councilman Flynn and his constituents don’t like being fined when they run red lights and risk the safety of people around them. I’m all for safer streets but understand that they don’t even make the Top Fifteen reasons for crashes according to the Huffington Post. If people dying is your cause then what is your simplistic answer for the number of opiate deaths in Denver which was not 58 but 959. Simple math says that problem is over 16X bigger. Window dressing on streets won’t likely change much and Denver’s budget is currently constrained but heh, you’re welcome to put your money where your mouth is. There are a lot more downsides to our car-oriented streets that just the death toll though. The number of life changing serious injuries from crashes are important too. The illnesses and death caused by vehicle pollution should be counted as well. The constant noise of living near busy streets impacts people’s health. The costs people bear to buy, fuel, insure, and maintain cars to get around because we’ve made driving the only convenient option are hard for many people to afford. Those who can’t drive for financial or physical reasons are stuck with poor transportation options. Our kids can’t walk to school because we’re afraid they’ll be hit by cars. We can’t just look at the deaths, but how we have to alter our lives because we’re afraid of becoming one of those statistics. Yes, drugs are a problem, but unrelated an no excuse whatsoever to ignore the problem of our public streets, which we created and have complete control to fix. Many good points. If you can get the city to accommodate your desires you have my blessings. The discussion seems to center on vehicle control, but doesn’t give enough time to pedestrian control. I don’t know how many crashes are the pedestrian’s fault, but I’d hope that statistic is studied carefully and any new rules reflect the disconnect between each side’s ideas of what’s supposed to occur.